How Do Clamp Meters Measure Current? So, you have met the clamp meter, the superstar of all multimeters that everyone’s talking about? And are now looking for a guide that will help you use it properly to measure AC and DC amps? You want to own it, but it makes sense to first see how the thing works, right? Well, you have come to the right place. This is the ultimate guide on how to use clamp meter, structured keeping first-time users and beginners in mind. Learning how to operate a clamp meter is easy and straightforward. You are already halfway there if you know how to operate a general-purpose multimeter. But, it is important to know the slight differences between them, which will help you make informed decisions while testing and troubleshooting. A professional technician knows both how a clamp meter works and how best to use it in a work environment. A clamp meter is an advanced variation of a regular multimeter with the major difference of a jaw-like structure on the top that allows contactless measurement of current and voltage. You can ‘clamp’ this structure around conductors (a wire, for instance) to detect the current running through it. With this being the basic principle, modern clamp meters come with functions that enable measurement of several quantities, features that make troubleshooting and analysis easier, and ultimately, more safety measures. 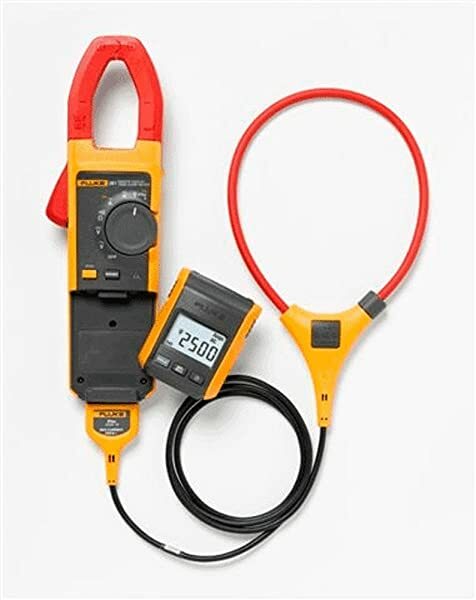 Since you don’t have to manually plug testing probes/leads to live circuits and also don’t have to disconnect the system to take a measurement, clamp meters have quickly become one of the most important tools in an electrician’s life. A clamp meter and a digital multimeter (DMM) usually go hand-in-hand as you cannot use them interchangeably for some testing applications. Before we jump into how to use a clamp meter, it is wise to first learn its basic components. Show below is an image of a Fluke 376 clamp meter. We will go over each component one by one, as described by Fluke in one of its blog posts. This will make learning how to measure amps with a clamp meter a lot easier. With respect to the image above, here is a list of major components of a clamp meter. We have mentioned parts that are exclusive to this model. It is clear that the jaw is the biggest difference in clamp meters. Based on the model that you choose to buy (refer our best clamp meter guide for help), these components and functions may vary. As mentioned above, clamp meters work on the principle of transformer action. The jaw-like structure or the clamp of a clamp meter is made up of a ferrite core with copper windings around it. This core and its windings act as a secondary winding (as in a transformer). So, when this jaw-like structure is “clamped” around a current-carrying conductor, it detects the current and couples it. This coupled current is then transferred from the ferrite core to the shunt of the tester’s input. Since this coupled current is a very small amount (usually 1/1000th), the tester adjusts this value by multiplying and providing the accurate current magnitude. It is because of this principle that clamp meters can measure high magnitudes (in thousands) of current. In other words, if you are measuring a conductor that is carrying a current of 1 ampere, the tester will detect it as 1 milliamp and then convert it into the original value. This value is displayed to you on the screen. Since analog models are not widely in use today and it is recommended that you buy a digital model, we will only focus on the working of a digital clamp meter. Additionally, in the following guide, the steps are only for measuring DC amps or AC amps. For all other quantities, the process is similar but you will have to select the respective function in the dial. Select the AC current or DC current function using the dial. Then close the jaw-like structure and level the conductor between the alignment marks inscribed on the jaws. The display will show the appropriate reading. Users can change the resolution as per requirements, but most meter models do this automatically. It is recommended that all measurements should be taken for conductors that are insulated properly. DO NOT measure around live wires. Some models also have the additional feature of a flexible current probe which can be used to measure current and voltage of conductors in small areas where using the rigid jaw-like structure becomes difficult. First, attach the other end of the probe to the meter and then proceed. The process is similar with the only change that you have to ensure the probe is properly wound and then connected back to the meter. Select the proper function (meters with this feature will usually have a separate function on the dial). The display will instantly show the corresponding measurement. Using a clamp meter is easy if you understand how it works. It becomes easier if follow this guide while experimenting with it. So, take out your new tool and measure away.